There are 40 posts tagged apple (this is page 1 of 4). If you are going to read one review of Microsoft Surface 2, make it this one by Lukas Mathis who is a long-time Mac user. Another difference between the Surface and an iPad is the Surface’s split screen mode. iPad owners often note that the iPad’s «one app owns the screen» system is a good idea, since people can’t multitask anyway. But that ignores that people often need multiple apps to work on a single task. I can’t count the instances where I’ve used split screen mode just in the last few days. I’m in a meeting, taking notes in OneNote while looking at last week’s meeting notes. I’m responding to an email while looking at a spec. I’m making a drawing while looking at a reference. I’m changing a mockup based on feedback in an email. I’m taking notes during a Skype call. This is definitely one of my main issues with the iPad as well. Not being able to research something while writing at the same time is a big pain. Pasting the research content into the writing app is a poor way of solving the problem. What I would like to see is something like what Microsoft have done with Surface, but with an Apple twist. Something in the lines of having a main app which runs in normal iPad mode, and the ability to run a second app in 1/4 of the space in landscape mode. The twist being that the secondary app has to be a multi-platform app, and when bringing it up in secondary mode, its iPhone user interface is shown. This could fit quite nicely and would be a terrific asset, and I can imagine a lot of use cases where this would be a fantastic way of getting things done. The problem with Metro might not be that it’s performing badly at its intended function. The problem might simply be that, unlike me, most people don’t want to use their tablets for productivity. They’d rather keep using their old Windows PC for that, and also have an iPad for watching movies and playing games. This is a valid and fair point. Having the ability to distinctly separate devices for work and play can definitely bring peace of mind and the ability to focus better1. I personally prefer using the iPad for as many things as possible2, including reading, answering email and using productivity tools such as OmniFocus and the calendar. When in serious “work mode” though, nothing beats the MacBook Air. 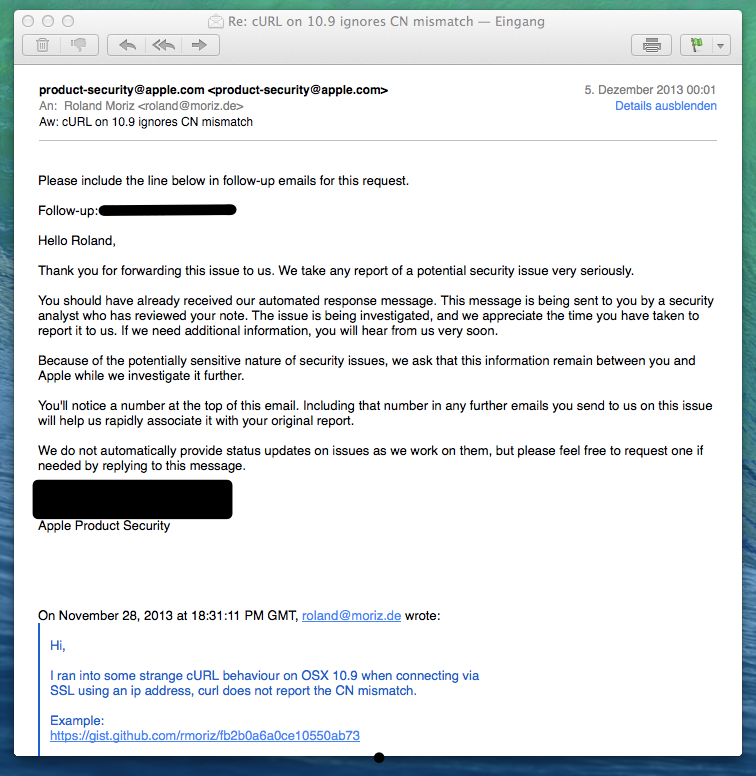 Apple finally released Mac OS 10.9.2, fixing the broken SSL implementation, which was patched for iOS a few days ago. Applying the update using an untrusted SSL tunnel to Mac AppStore should be fine since the binary contains a signature which is verified before the installation begins. Information regarding the vulnerability is currently terribly scarce, but judging by the information in the Apple KB, it sounds very serious indeed and would allow man-in-the-middle attacks on SSL/TLS connections. What this means in reality is that someone who sits between you and a target site, such as your bank or Facebook, would be able to listen in on your traffic and potentially modify information as it is being sent to the server. While I’m usually not the one frolicking over the latest Apple rumors, but images of a possible iPhone 6 have appeared online, and boy does it look sweet! The bezel is all but gone on the sides and sports a slightly larger screen than the older phones. A few days ago, Apple celebrated the 30 year anniversary of the Macintosh. To celebrate, here is a keynote from 1984 featuring Steve Jobs presenting the first ever Macintosh to the Boston Computer Society. You get to see Steve when Steve became the Steve Jobs. Seeing him smiling up there is the way a lot of us would like to remember him.